Marfa Public Radio believes in the capacity of public media to shape and animate who we are, where we live, and how we relate. Public media from West Texas serves a critical role in our state and our nation: from border stories to energy stories, West Texas is a part of the country whose stories need to be amplified. MPR has been one of the most awarded small-market stations in the nation for excellence in journalism. The Corporate Support Account Manager is ready to take their media sales career to a meaningful place. This team member is a determined, persuasive, skillful media sales professional. And, s/he loves public radio. In this outside sales position you will sell radio sponsorship messages and event sponsorships. An account manager in public media is like that of a salesperson in commercial broadcasting or local print media. In this consultative sales role you will make cold-calls to decision makers at local businesses, meet with them to understand their marketing needs and develop proposals that offer marketing solutions to help them grow their businesses. This is a full life cycle sales position in that you will prospect, conduct needs assessments, create and present proposals, close the deal, write copy and service the account. While managing an account list you will also focus on developing new business. Media sales experience is high on our list. 3+ years is what we are looking for. Sales in broadcast and digital is preferred. 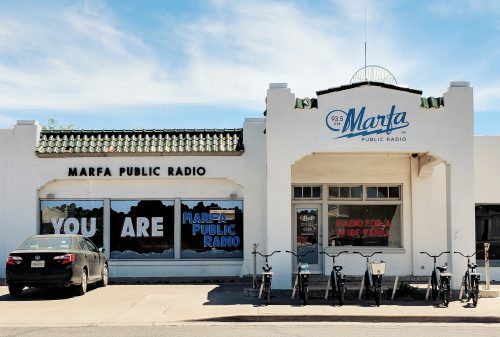 Passion for Marfa Public Radio and West Texas Public Radio and all that the station offers. We are looking for a BIG fan! Knowledge about the programming is beneficial. Smart – We are looking for someone who “gets it” and can think strategically to achieve station, client, and personal goals. Relationship building – establishing relationships face-to-face and virtually to achieve business relationships that are credible and trustworthy. Communication skills – thoughtful and persuasive verbal and written communications skills. Can you create credible and professional visual presentations and proposals? Market research – the ability to gather market data and use it appropriately to sell multiple platforms. New business development – can you secure new business by using a disciplined sales process? Bachelor’s degree in marketing, business or related field is preferred. This is a part-time contract position based in the Permian Basin. The best candidate has a strong network in and knowledge of the Midland and Odessa communities. To Apply: email (1) a letter explaining your interest and how your skills are aligned to this position and (2) your resume to: underwriting@marfapublicradio.org.